As we age, our skin loses its ability to regenerate. The fat cells beneath the skin begin to shrink and the inner layers of our skin become thinner. Skin loses its firmness and elasticity and we’re left with wrinkles. Everyone will have to deal with wrinkles at some point, but the severity of the problem will differ from person to person depending on genetics, weight fluctuations, sun exposure, and the kinds of skin products we use over time. Don’t worry, you don’t have to make any Botox appointments or go out and buy tons of expensive wrinkle creams. There are plenty of natural, affordable, effective ways to reduce the appearance of wrinkles. One of them is coconut oil. We’re about to tell you exactly how to use it, but first, take a look at why it works. Coconut oil can be used in combination with many other natural ingredients that keep skin healthy, firm, and smooth. Try all the methods below until you find the one that works best for you. Remember to use organic, unprocessed coconut oil for the following remedies. Coconut oil alone is an excellent remedy for wrinkles. Before bed each night, simply massage organic coconut oil into wrinkled skin until it absorbs completely. For added benefit, consume 3 tablespoons organic coconut oil each day to provide your body with the nutrients it needs to keep skin healthy. Milk hydrates skin while egg white tightens it to prevent sagging and wrinkles. In a bowl, whisk together 1 teaspoon each of organic coconut oil and honey, 1 egg white, and 1 tablespoon milk. Use fingertips to massage mixture into skin. Leave on 30 minutes, then rinse with lukewarm water and pat dry. You can mix coconut oil and egg white to get rid of sagging skin around mouth. This works well for wrinkles on the body. Massage virgin coconut oil into skin until completely absorbed. Or apply coconut oil on damp skin after bath. Massage gently and wash with water without soap and pat dry. Repeat daily to reduce the appearance of wrinkles. Olive oil moisturizes and nourishes skin while Shea butter restores elasticity. In a sauce pan, melt 1 teaspoon of each of organic coconut oil, extra virgin olive oil, almond oil and 1 tablespoon of Shea butter over low flame, stirring until combined. Let cool to touchable temperature and use fingertips to massage into skin until absorbed. Leave on 30 minutes or overnight, then rinse with lukewarm water and pat dry. Repeat twice a day i.e. once in the morning and once at night time before going to bed. Vitamin E oil helps heal damaged skin while supporting the growth of healthy new skin cells. In a sauce pan, over low flame, melt 1 tablespoon of organic coconut oil and the oil from 2 vitamin E capsules, stirring until combined. Let cool to room temperature and use fingertips to massage into skin. Leave on 15 minutes, then rinse with lukewarm water and pat dry. For added benefit, include ½ teaspoon lavender oil. Oatmeal exfoliates to remove dead skin cells and other toxins, while yogurt kills the bacteria that clog pores and cause blemishes. In a blender, mix 1 ½ tablespoons of organic coconut oil, ½ cup of plain, unsweetened oatmeal, 6 ounces of plain Greek yogurt, and 2 tablespoons of raw honey until smooth. Use fingertips to apply to skin and leave on 15 minutes or until dry. Cucumber and aloe vera provide the nutrients skin needs to maintain moisture and elasticity. In a blender, mix ½ cup of organic coconut oil, ½ cup organic aof loe vera gel, and one peeled, chopped cucumber until smooth. Use fingertips to massage into skin until completely absorbed. Refrigerate leftover lotion and use twice a day. Boil ½ cup of filtered water and stir in ½ teaspoon of Borax. In another pan, heat 1 cup organic coconut oil until melted. Mix borax, coconut oil, ¾ cup of aloe vera gel, and 5-10 drops of your favorite essential oil. Refrigerate leftover lotion and apply daily. Cinnamon reduces the appearance of scars and dark spots. Mix 1 tablespoon organic coconut oil with ½ teaspoon cinnamon. Use fingertips to apply to skin and leave on 20 minutes. Argan oil reduces the appearance of wrinkles. Mix 4 ounces of organic coconut oil with 1 ounce of argan oil. Use fingertips to massage into deep wrinkles. Honey moisturizes, removes toxins from pores, and kills the bacteria that cause blemishes. Mix ½ cup of organic coconut oil with 1 tablespoon of raw, organic honey. Leave on 45 – 60 minutes and rinse with cool water. This method is particularly effective for reducing wrinkles around the jaw line. In the morning, on an empty stomach, swish 1 tablespoon of cold pressed organic coconut oil around in your mouth for 15-20 minutes without swallowing it. Spit it out after 20 minutes, then gargle with warm water and spit again. Note: Do not eat or drink (except water) anything before 20 minutes after oil pulling. For best results, follow the advice below when using coconut oil to reduce the appearance of wrinkles. Use coconut oil topically and internally. Use sunscreen with an SPF of at least 15 whenever you go outside. If you suffer from hypertension or high blood pressure, do not use coconut oil treatments. Coconut oil contains significant amounts of saturated fat, so consume it in moderation, especially if you suffer from cardiovascular issues. Always use organic, cold pressed extra virgin coconut oil. Commercial brands are processed and packaged with chemicals and preservatives that may damage overall health. Use a coconut oil with a lauric acid content of at least 40%. You can also find natural coconut oil soaps and skin products in some stores and online. Coconut oil can replace your regular cooking oil, and it can be used to make salad dressings. To keep skin smooth and healthy as you age, eat a healthy diet, get regular exercise, and drink 8 glasses of water a day. Have you tried any of these methods for reducing the appearance of wrinkles? Do you know of any methods we haven’t mentioned? Share your experience with us! How do I calculate grams of lauric acid to 40% in coconut oil? Check the label of the bottle to know the percentage. Why is coconut oil not safe to use on your skin if you have high blood pressure & are you a trained medical doctor? Why is coconut oil not safe to use on your skin if you have high blood pressure & are you a trained medical doctor? Why can’t this be answered immediately? Why is my question awaiting moderation?? What does that mean? Coconut oil in solid states melts as soon as it touches the skin. So, you can use coconut oil in liquid or solid state. It doesn’t matter. But make sure you use only organic, cold compressed coconut oil. I am 74. Do you think coconut oil can help with acne scars at my age? Can coconut oil help the scars from the acne? Yes, you can. Massage a small amount of coconut oil and leave it to dry completely. Repeat the process regularly until you achieve the results. 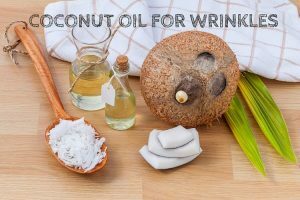 if you applied coconut oil on face wrinkles every night before going to sleep, how long will it take until you see results? It is difficult to say the exact time as everyone’s skin and healing capacity is different. For effective results, apart applying coconut oil you have to get good sleep and reduce stress levels. Will coconut oil help with age brown spots on the face ?? Yes, you can practice oily pulling as it doesn’t interact with the blood pressure medications. Cold compressed coconut oil is made in a heat-controlled environment that never exceeds 120 degrees. While the expeller pressed coconut oil uses more heat to extract the oil. Both the methods retain good qualities of coconut oil but have a different taste. Heat is the reason for the change in the taste. So, you can just use expeller pressed coconut oil as well for the home remedies, it will provide the same results. Can I use pure fractionated liquid coconut oil NOW brand, for face and neck wrinkles? I am 25 n have laugh lines n fine lines around mouth,will auravedic organic coconut oil work? Yes, it helps. Try it regularly without interruption until you achieve the results. Can I mix coconut oil with rose water on my face at night? Yes, you can. However, if you have oily skin then reduce the amount of coconut oil. Hi, i have two questions, first i use jason brand coconut oil is it cold compressed? My second question can i put coconut oil after i put a night cream? You can check the label of the jar to know whether it is cold compressed or contains any harmful chemicals. Don’t apply night cream before coconut oil as it can restrict its penetration. Instead you can apply coconut oil first and leave it to dry completely and then apply your night cream over it. Is it ok if i I use coconut oil on my face and skin daily I have high blood pressure? Yes, it is completely safe to apply coconut oil on the face and skin even if you have blood pressure. Doe’s also work well on dark skin-I mean African black skin ? As I’m 59 years of age black African wrinkled around the neck ,black spot around the eyes and face. Yes, coconut oil works for all skin types. Will fractioned coconut oil work for fine lines and wrinkles? Yes, the natural fats and antioxidants present in coconut oil help to reduce the wrinkles and fine lines. I also has rosacea. Will the fractioned coconut oil reduce the inflammation and redness from it? Yes, coconut oil also helps to reduce the swelling and redness caused by rosacea. Will Coconut Oil help with Saggy Turkey Neck? Can the coconut oil usage at night be combined with the usage of an eye cream in the morning? I use Body Shop’s Vitamin E under eye cream. Will the coconut oil help get rid of a wrinkle across the nose caused from glasses? Is there anythig that will help wrinkled skin on forearms after weight loss? Can I use these recipes and bottle the contents? Or is it better used ASAP? Clicks coconut oil, is it good for my face seance i can’t aford organic oil?